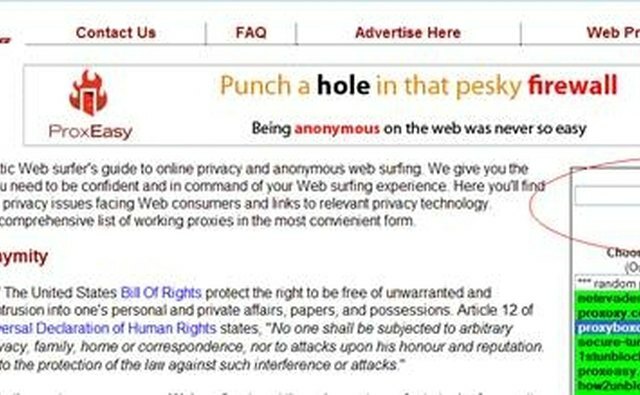 Many Internet users consider anonymity a right that is violated when companies track their IP addresses and the sites they visit. If you're adamant about protecting your identity online, there are several ways you can make a website untraceable to you. Protect yourself using proxy sites. Visit the Proxy Organization's website to find a list of proxy websites (see Resources). Enter the URL you want to visit and press the "Go" or "Submit" button on the proxy site. Each time you visit a website, go back to the proxy page and enter the site's URL to remain anonymous. Join a proxy network for constant protection without having to enter your URL requests every time you visit a new site. Popular proxy networks include: Freenet, I2P, JAP and TOR. You may be asked to "Share your bandwidth" with these networks as they work off of peer-to-peer architectures. Be aware that your personal security may be compromised if you use an untrustworthy proxy network. Download proxy software, such as Proxy Way, to ensure full anonymity. Most free proxy software simply provides an interface to navigate you to a website anonymously. However, programs such as Proxy Way continue to run in the background for additional protection and ease of use. Use proxy sites, network and software in tandem for a higher level of protection. For instance, attach yourself to a proxy network and use a proxy website to ensure added security. Using multiple encrypted sources is always a smart route when attempting to surf the Internet anonymously. Proxy surfing is not always 100 percent anonymous, as errors may occur and certain sites may not allow proxy addresses to filter through. Test your proxy software whenever possible at sites such as WhatIsMyIP.com, which will tell you your IP address; if it matches your actual IP address, you are not protected and may want to look into other options.